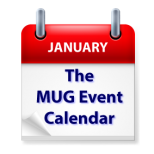 The MUG Event Calendar starts off with a short week for 2017 due to the New Year’s holiday. A group in Missouri will start the year off helping members organize their photos, while a group in Connecticut will discuss getting stuff working, a perfect post-gift-giving holiday topic. A California group will discuss working with GoPro cameras, and the Microsoft Hololens will be the topic for a second Connecticut group. appleJAC – "Organizing Pictures with Apple Photos"